A few years ago, I had one of those “aha” moments that forever changed my perception of young readers and writers. I had entered the local comic book store with my son, with the intention of joining something known as 24-Hour Comic Day. It is an event that challenges people to write a 24 frame comic in a 24 hour period. My oldest son was into making comics, and I was curious. I also came armed with some ideas of my own, telling the story of my relationship with my brother in Brothers on Ice. I was expecting a few people to gather for the event. What I witnessed, instead, was a book store that was nearly wall-to-wall writers and illustrators, sitting and standing in every place possible. And nearly all of them were young people. And many of these writers were boys, the very demographic of young learners that I often had trouble reaching as readers in my classroom. Yet here they were, writing for hours at a time, collaborating with others, sharing work and gathering feedback. It was as if I had stumbled upon some secret writer’s society, and perhaps that what it was. When we think of Connected Learning principles, finding your niche and interest remains front and center, and for many young people, writing comics and reading graphic novels hits that vein. This began a journey, still unfolding, in which I first worked with students at a digital writing camp around webcomics for a few years, and then moved the concept into my classroom. 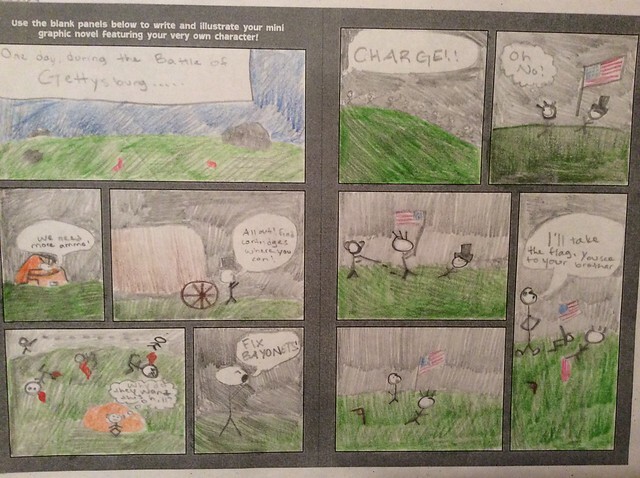 Since then, making comics and its digital cousin, webcomics, have become a regular activity for my students. From writing prompts to text analysis to collaborative retelling of stories, comics are a common medium for us. We don’t always go digital, either. Sometimes, it works best to let the young artists create off the screen. Here is one page from a class paper comic that was part of our discussions around the reading of The Mostly True Adventures of Homer P. Figg. Still, the digital does provide for interesting possibilities. 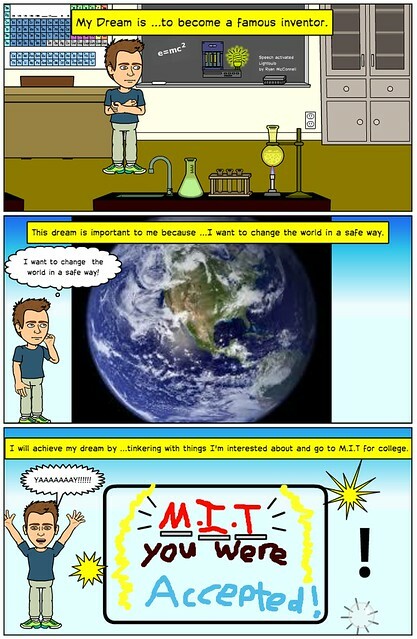 We also use webcomics for a project at the start of the year, where students explain their aspirations for the future. This Dream Scenes project is a natural fit for comics. 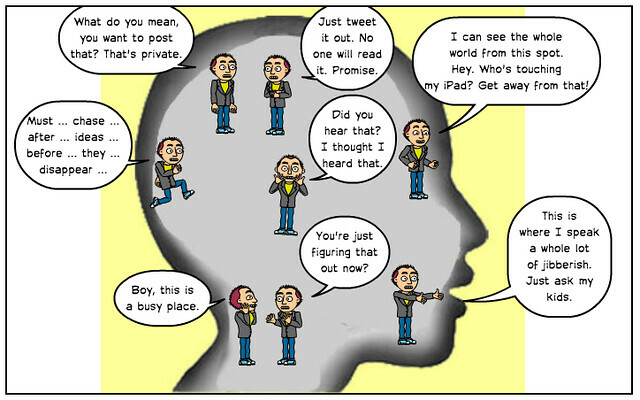 And they make Six Word Memoirs, constructed and shared as digital comics. What affordances do webcomics, with their digital nature, have over regular comics? Scott McCloud dove into this issue in great detail in his Reinventing Comics book (a follow up to his now-classic Understanding Comics tome, which is like a bible for comic lovers). Interestingly, McCloud wrote this book in 2000, just on the cusp of the real digital revolution. Still, his insights into possibilities were prescient. Comments and feedback are often part of the system. Want to examine a possibility of the webcomic world? Check out Randall Monroe’s xkcd webcomic, where Monroe regularly experiments with the possibilities of webcomics along with traditional comics. His piece — Click and Drag – is one example of how he is pushing the edges of possibilities. As the title implies, you click and move through a comic that goes on and on and on, telling a narrative outside the frame. It doesn’t end there, though. Because Monroe has a large audience, they began to take his comic and remix it and crowdsource elements of it together. Check out the wiki page about the comic. See a map that someone built to represent the entire comic. Venture into a more zoomable remix of the comic to get a better sense of scale. I also adhere to the notion of “write alongside students” and that includes “make comics alongside students,” as evidenced by a few comic series that I have done over the years. 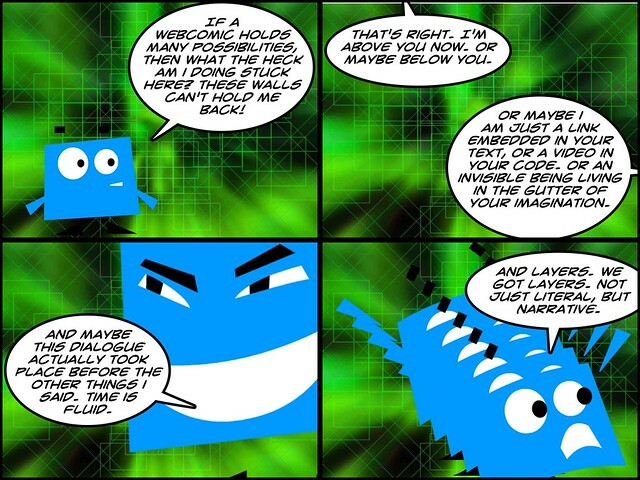 The most prominent was a regular comic strip about the so called “digital divide” between students and teachers that I named Boolean Squared, and which ran on the website of our regional newspaper for two years before I retired the idea. 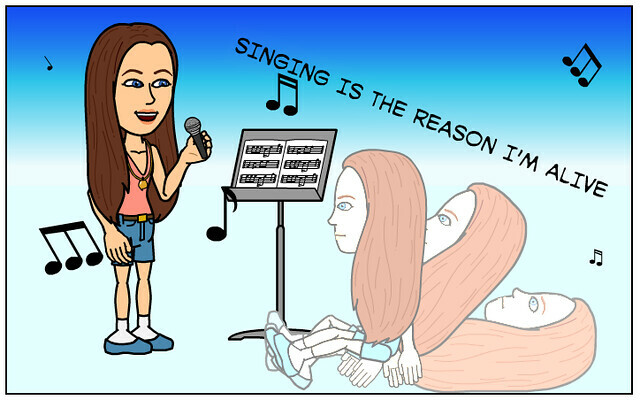 And I make comics all the time, inspired by our classroom and our discussions. If you are seeking more resources around bringing comics into your classroom, feel free to use anything I have gathered at my Comics in the Classroom website, which I share with teachers on a regular basis. Go ahead. Start a panel. Who knows where it will bring you. PS — As I writing this piece, Edutopia put together a “Five Minute Film Festival” on the use of comics in the classroom. Kevin Hodgson is a sixth grade teacher and co-director of technology for the Western Massachusetts Writing Project.